I serve these butter replacer recipes to my children without their knowing it was not butter. Sweet and spicy is another example of the amazing versatile avocado. It’s easy to find salad dressings that taste good, but I can tell you from experience, it can be a real challenge to find dressings that both taste good and are healthy. Almonds are considered the "king" of nuts and are 18% protein. Raw almonds are high in omega 9 and omega 6 and low in saturated fats. Place all ingredients in blender jar. Process briefly until blended but not smooth. Preparation time, 10 min. One hour to chill. Cover and refrigerate. Powder sesame seeds in seed grinder mix all ingredients together with fork. The sesame seeds and yeast thicken the salsa sauce, allowing it to stick better to your veggies. 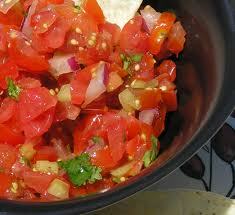 Like the salsa but added some fresh oregano to tie it all together. Do you have any decent gazpacho recipes? ?